Diabetic ketoacidosis (DKA) and hyperosmolar hyperglycemic state (HHS) are diabetes emergencies with overlapping features. HHS is much less common than DKA. In HHS, the main features are extracellular fluid volume (ECFV) depletion and hyperosmolarity. HHS also has been reported following cardiac surgery and with the use of certain drugs, including diuretics, glucocorticoids, lithium and atypical antipsychotics. The clinical presentation of DKA includes symptoms of hyperglycemia, Kussmaul respiration, acetone-odoured breath, ECFV contraction, nausea, vomiting and abdominal pain. There also may be a decreased level of consciousness. In HHS, there is profound ECFV contraction and decreased consciousness. There can also be neurological presentations, including seizures and a stroke-like state that can resolve once osmolality returns to normal. Sick day management that includes capillary beta-hydroxybutyrate monitoring reduces emergency room visits and hospitalizations in young people. DKA or HHS should be suspected whenever patients have significant hyperglycemia, especially if they are ill or highly symptomatic. Point-of-care capillary beta-hydroxybutyrate may be measured in the hospital in patients with type 1 diabetes with capillary glucose >14.0 mmol/L to screen for DKA, and a beta-hydroxybutyrate >1.5 mmol/L warrants further testing for DKA [Grade B, Level 2]. Ketones in both the serum and urine should be measured. If there is an elevated anion gap and serum ketones are negative, beta-OHB levels should be measured. Measurement of serum lactate should be considered in hypoxic states. Pregnant women in DKA typically present with lower glucose levels than non-pregnant women, and there are case reports of euglycemic DKA in pregnancy. Patients with DKA and HHS are best managed in an intensive care unit or step-down setting with specialist care. Search for precipitating cause [Grade D, Consensus]. Possibly insulin to further reduce hyperglycemia [Grade D, Consensus]. Volume status (including fluid intake and output), vital signs, neurological status, plasma concentrations of electrolytes, anion gap, osmolality and glucose need to be monitored closely, initially as often as every 2 hours. The sodium deficit is typically 7-10 mmol/kg in DKA and 5 to 13 mmol/kg in HHS, which, along with water losses (100 mL/kg and 100 to 200 mL/kg, respectively), results in decreased ECFV, usually with decreased intracellular fluid volume. In individuals with DKA, IV 0.9% sodium chloride should be administered initially at 500 mL/h for 4 hours, then 250 mL/h for 4 hours [Grade B, Level 2] with consideration of a higher initial rate (1–2 L/h) in the presence of shock [Grade D, Consensus]. For persons with a HHS, IV fluid administration should be individualized based on the patient's needs [Grade D, Consensus]. The typical potassium deficit range is 2 to 5 mmol/kg in DKA and 4 to 6 mmol/kg in HHS. 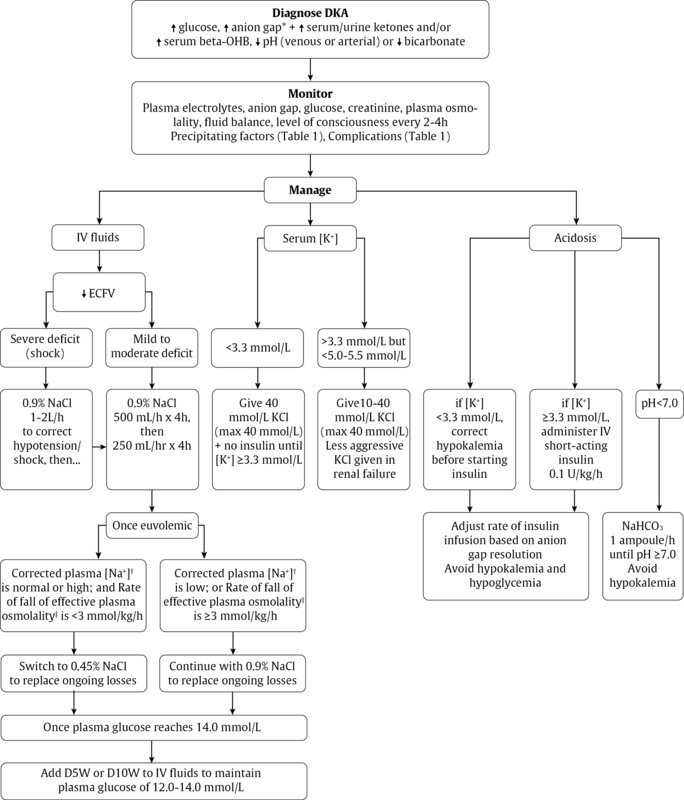 Typical recommendations suggest that potassium supplementation should be started for plasma potassium <5.0 to 5.5 mmol/L once diuresis has been established, usually with the second litre of saline. If the patient at presentation is normo- or hypokalemic, potassium should be given immediately, at concentrations in the IV fluid between 10 and 40 mmol/L, at a maximum rate of 40 mmol/h. In the case of frank hypokalemia (potassium <3.3 mmol/L), insulin should be withheld until potassium replacement at 40 mmol/h has restored plasma potassium to ≥3.3 mmol/L. Metabolic acidosis is a prominent component of DKA. Patients with HHS have minimal or no acidosis. In individuals with DKA, an infusion of short-acting IV insulin of 0.10 U/kg/h should be used [Grade B, Level 2]. The insulin infusion rate should be maintained until the resolution of ketosis [Grade B, Level 2] as measured by the normalization of the plasma anion gap [Grade D, Consensus]. Once the plasma glucose concentration reaches 14.0 mmol/L, IV dextrose should be started to avoid hypoglycemia [Grade D, Consensus]. Similar doses of IV insulin can be used to treat HHS. Generally its use is recommended to reduce plasma glucose levels. Sodium bicarbonate therapy can be considered in adult patients in shock or with arterial pH ≤7.0. Potential risks associated with the use of sodium bicarbonate include hypokalemia and delayed occurrence of metabolic alkalosis. In patients with DKA, plasma osmolality is usually ≤320 mmol/kg, but is >320 mmol/kg in HHS. Because of the risk of cerebral edema with rapid reductions in osmolality, the plasma osmolality should be lowered no faster than 3 mmol/kg/h. This can be achieved by monitoring plasma osmolality, by adding glucose to the infusions when plasma glucose reaches 14.0 mmol/L to maintain it at that level and by selecting the correct concentration of IV saline. If osmolality falls too rapidly despite the administration of glucose, consideration should be given to increasing the sodium concentration of the infusing solution. Water imbalances can also be monitored using the corrected plasma sodium. There is currently no evidence to support the use of phosphate therapy for DKA, and there is no evidence that hypophosphatemia causes rhabdomyolysis in DKA. However, because hypophosphatemia has been associated with rhabdomyolysis in other states, administration of potassium phosphate in cases of severe hypophosphatemia may be considered for the purpose of trying to prevent rhabdomyolysis. About 50% of deaths due to DKA or HHS occur in the first 48 to 72 hours. Mortality is usually due to the precipitating cause, electrolyte imbalances (especially hypo- and hyperkalemia) and cerebral edema. ECFV, extracellular fluid volume; ECG, electrocardiographic; DKA, diabetic ketoacidosis; HHS, hyperosmolar hyperglycemic state. ∗ Severity of issue will dictate priority of action. Administer IV normal saline initially. If the patient is in shock, give 1–2 L/h initially to correct shock; otherwise, give 500 mL/h for 4 hours, then 250 mL/h for 4 hours. Add potassium immediately if patient is normo- or hypokalemic. Otherwise, if initially hyperkalemic, only add potassium once serum potassium falls to <5 to 5.5 mmol/L and patient is diuresing. Once plasma glucose reaches 14.0 mmol/L, add glucose to maintain plasma glucose at 12.0–14.0 mmol/L. After hypotension has been corrected, switch normal saline to half-normal saline (with potassium chloride). However, if plasma osmolality is falling more rapidly than 3 mmol/kg/h and/or the corrected plasma sodium is reduced, maintain IV fluids at higher osmolality (i.e. may need to maintain on normal saline). DKA, diabetic ketoacidosis; HHS, hyperosmolar hyperglycemic state; IV, intravenous. If you would like more details on this topic, please visit the Canadian Diabetes Association Clinical Practice Guidelines: Chapter 15.